Few things in their lifetime would have broken their hearts as much as missing out on the World Cup Trophy by a kitten's whisker last year. India - unbeaten in the tournament - are set to face England in the semifinal of the Women's World T20 tomorrow night. Team India have been on a winning roll, having steamrolled two of the tournament's prime contenders in Australia and New Zealand, alongside victories against Pakistan and Ireland. While England made it to the semis before their last group match as well, a defeat at the hands of the defending champions and home team West Indies would have shaken their spirits a bit. India would love to seize on the relatively low confidence England team are having at the moment. The team is determined to win their first World T20, and won't let anyone else touch that trophy if they were to decide. There is a reason that makes this encounter a must watch for fans all around the world. 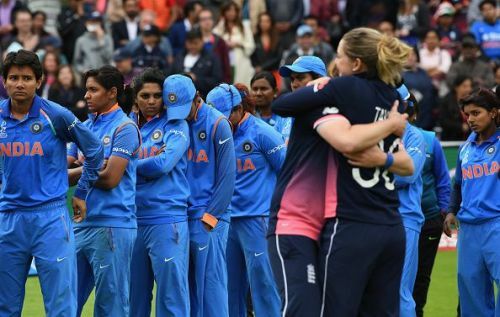 Indian Women suffered a heartbreaking loss at the hands of England in last year's World Cup final at Lord's. India began that tournament with a stunning victory over the home team and three-time World Cup champions England. The team went on to win their next three matches as well, before suffering a small hiccup on their way to the final. The final, which was one for the ages for the neutral spectator, was all for India's to lose with 38 runs needed off 43 balls with seven wickets in hand. England held their nerve, and Anya Shrubsole found a magnetic connection between the ball and the wickets. From a winning position, India collapsed and England won the final by just nine runs. The Indian Women's team would be feeling the same way as - if not worse than - the Bangladesh Men's team had after two last-ball defeats to India in tournament finals this year. For sure, Bangladesh would be raring to rub shoulders with India to settle their previous accounts. Similarly, the Indian Women's team would be raring to avenge their World Cup final defeat, with both teams set to face off yet again on a big stage. In a profile video created during the ongoing tournament, many of the player's confessed that losing the World Cup final at Lord's last year felt as bad as losing a family member. Now that they have witnessed the worst that can happen in the final stages of a tournament, they would have the courage to tackle with such a situation - if it comes again. Many of the players who were a part of the Indian men's 2011 World Cup victory, had been t part of a side that lost a record number of one-day finals during the early 2000s. Rafael Nadal almost had a psychological edge against arguably the greatest Tennis player of all time - Roger Federer. But just like the Indian team did in 2011, Federer decided to drop any fear or psychological stranglehold Nadal had over him during the epic Australian Open Final in January 2017. England have four World Cups and one World T20 to their name, while India have none. England have got the better of India in most of their ICC tournament encounters. While India's head to head record against England in Tests and ODIs is more or less balanced, England have had the upper hand in T20Is - winning 10 out of the 13 matches played between the two sides. That is another record India would love to better, and what better occasion could one think of than a World Cup semifinal?